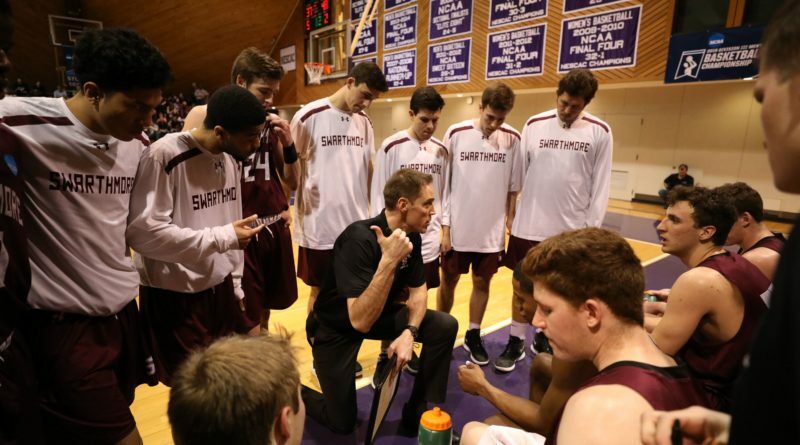 The Swarthmore Men’s Basketball team recently wrapped up what was undoubtedly the greatest season in the College’s history by securing its second Centennial Conference title and their first ever Final Four and NCAA DIII National Championship appearance. The team was virtually untouchable this season, going an impressive 29-4 overall and 15-3 in conference play, good enough to host the Conference tournament for the third year in a row. The team carried an eight game win streak into the Conference tournament, and used that momentum to secure double digit wins in both the semifinal against Washington College and the championship game versus Johns Hopkins. This marked the fourth year in a row the Garnet earned their way to the Conference championship game. After the Conference tournament, the No. 6 ranked Garnet hosted the first two rounds of the tournament. By then carrying a ten game win streak and 14-1 record at home, the team absolutely breezed through the first two rounds, beating Mitchell College by 17 and No. 12 MIT by 40. With the win streak now at twelve games, the Garnet took their talents to Amherst College, where they edged out both No. 5 Randolph-Macon in the Sweet 16 by a score of 58-57 and No. 14 Nichols College by 69-65 in the Elite Eight. The Garnet then traveled to Fort Wayne, Indiana to play No. 9 Christopher Newport. There was some unfinished business between the schools, as Christopher Newport knocked out the Garnet in the second round of the tournament at home two seasons ago. The Garnet got revenge, winning 70-63 in the Final Four, and advanced to their first ever NCAA DIII National Championship game. At this point, the Garnet were riding a fifteen game winning streak and had beaten four consecutive nationally ranked opponents. The Garnet were set to face No. 4 Wisconsin-Oshkosh in the title game. Wisconsin Oshkosh opened up their season with a narrow 82-70 loss against Division I Wisconsin-Madison. With its student body of nearly 14,000, it could easily compete as a mid-major Division I school. The atmosphere was all too familiar for the Titans, as they had made it to the National Championship the year before, but fell victim to Nebraska Wesleyan. Wisconsin Oshkosh took an early lead in the game and, although the Garnet were able to compete, the early lead proved to be the big difference-maker. Nonetheless, the Men’s Basketball team walks away cemented into the history books. Senior Cam Wiley wraps up one of the most historic careers in school history. If he isn’t the best player in school history (which he probably is), he is undoubtedly the most impactful player to wear the S. Wiley ends his career as a three-time First-Team All-Conference selection. He was two-time First-Team All-Region and one-time Second Team. Wiley takes home two All-American awards, once as a First-Team member and once as a Third-Team member. Wiley is also a two-time Conference Player of the Year with two Centennial Championships on his resume. Statistically, Wiley is first and fourth for most points scored in a single season. He is tied for second in the most threes made in a single season and is the leader for most assists in a single season. His 1,565 points put him third all-time, and his 187 threes put him tied for second all-time. Wiley spoke about how he was able to have such a successful career. The one accolade on Wiley’s resume he will never forget is his trip to the NCAA DIII National Championship. He’s confident the team will be back soon. Wiley cites the team culture as being one of the biggest reasons the team has been so successful the past several years. Wiley isn’t the only star on the team, as the Garnet’s depth is one of its biggest strengths, and a big reason why the team will continue to compete in the coming year. The Garnet have two powerful weapons down low in juniors Zac O’Dell and Nate Schafer. O’Dell was named First-Team all-conference and took home the Defensive Player of the Year award, after taking home Second-Team all-conference last year. O’Dell led the conference in Blocks per Game with 2.3, was third in rebounds per game with 8.1 and first in Field Goal percentage at 62.6 percent. Shafer was not far behind O’Dell, taking home Second-Team all-conference after averaging 7.4 rebounds per game and shooting 57.8 percent from the field. Shafer had 2.2 blocks per game. O’Dell and Schafer were the only two players to average above 2.0 per game in the blocks department. The Garnet also have the best three-point shooter in the conference in sophomore Conor Harkins. The Honorable Mention all-conference selection made 110 threes, good for the all-time single-season school record ahead of himself and Cam Wiley at 76. Harkins has 186 threes so far, only one less than Wiley, and only 23 behind the all-time record of 209, with two seasons to play remaining. 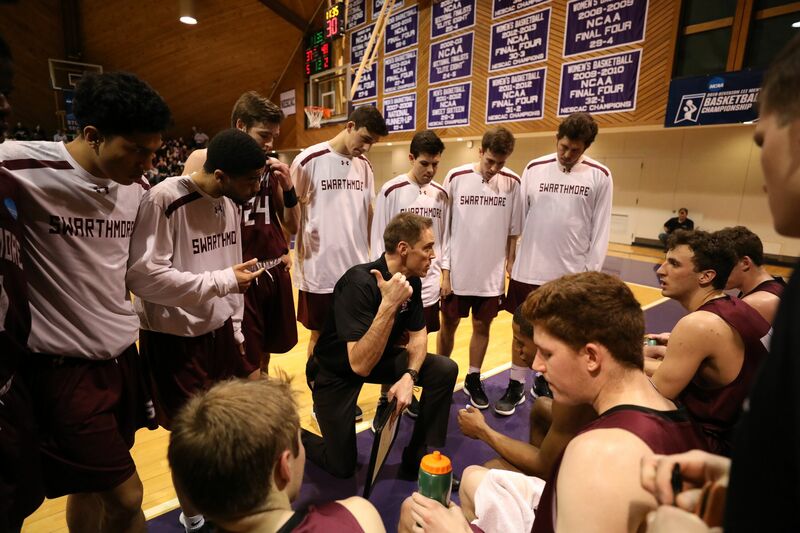 The Garnet also have one of the best coaches in the country, as Landry Kosmalski earned both Centennial Conference and All-Region Coach of the Year. Kosmalski’s impact on the program has been more than noticeable. Wiley spoke about Coach Kosmalski’s impact. The Garnet finished the season ranked No. 2 overall in the country. The success of the team isn’t going anywhere anytime soon. “I think our program is going to be good for as long as we stay committed to our principles,” said Wiley.